Philips has gone all out on its home cinema audio at this year's IFA show, unveiling three new 3.1 soundbars and a high-end wireless kit that can transform from stereo to 5.1 surround in seconds. The new Fidelio E6 Wireless Surround Speakers are the latest addition to the E-series range and carries the now-distinctive detachable setup that allows you to peel off two layers of audio to immediately set up a full 5.1 surround sound experience. Combined with the central speakers, a wireless subwoofer helps deliver deep bass with stereo audio. But if you want to dip into home cinema, 5.1 sound for that big screen movie fix, you can quickly detach the top section of the central speakers to create a surround experience without trailing wires around your room. The detachable wireless surround units are good for around five hours of audio playback and will start charging again as soon as stick them back on top of their parent speakers. Now, it may only look like there's a 4.1 setup here but, in a first for Philips, those twin front speakers include angled 3-inch drivers to create the central audio channel without any extra hardware. Inevitably now though it's not just about the home cinema chic as the new Fidelio E6 also features Google Cast and Spotify Connect for when you're in the mood for a musical fix. But you're going to have to pay for that fix as right now we've been given an €900 price tag for the set when it gets released at the end of the year. A little more reasonably-priced are Philips new 3.1 soundbars. These new soundbars are designed with a focus on getting the best vocal clarity from their audio, using specially positioned drivers, dedicated to the central audio channel, to achieve this. They're not the first soundbars around to dedicate drivers to the central channel, but are the first with this price tag. 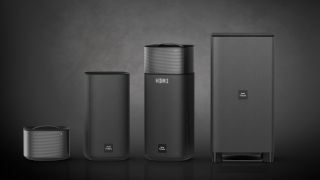 "The additional dedicated driver for the center channel means that you can now hear every whisper in a movie or TV show, an experience that is difficult to achieve with a traditional soundbar that only has left and right channels," said Rodney Chan, Video and Home Cinema Business Leader, Gibson Innovations. "This is a first for home cinema quality sound in this price range." Flying in the face of that Fidelio E6 setup, with its actual surround sound, the new Philips soundbars come with Dolby Pro Logic II to create a virtual surround experience. All three bars come with external subwoofers, with the top two (the Philips HTL5160B and HTL3160B coming in at €350 and €230 respectively) rocking wireless versions to avoid any more unnecessary wire-based clutter around the home. The wired 3.1 HTL2183B is a relative snip then at €170. The art of movie sound effects.